Liberia Airport, Daniel Oduber Quiros (LIR) is the second airport on importance in Costa Rica, this airport is just a few miles from the most beautiful and exotic beaches. Have the best trip in Costa Rica with ECOTRANS! 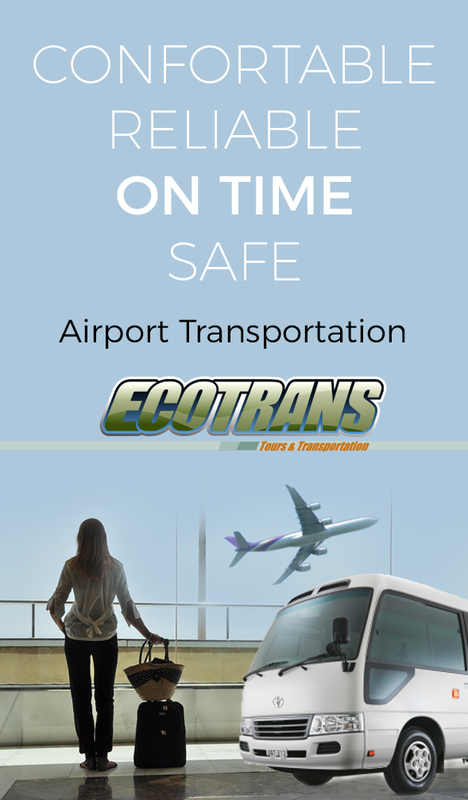 Don't you worry about your ride after you’ve landed at Liberia Airport, whether alone or in a group, ECOTRANS can fit the needs of any traveler with our shared-ride or private transportation. We have the best fleet including late model vans and minivans provided with comfortable seats, A/C, USB - AC power, and complimentary Wi Fi on board. Make your reservation in advance and we will track your flight, so you can make sure that our representatives will be just in time waiting for you. Our team will be working for you to have a safe and great ride! ECOTRANS is the greatest option to move from Liberia Airport, Daniel Oduber Quiros (LIR) to multiple destinations in Costa Rica. Our transportation service offers you shared or private service to different destinations around Costa Rica, our representatives are always prepare to give you a warm welcome and a great guiding and our drivers will be ready to take you to your hotel, house or where you need to go. We can also can assist you with planning your trip to Costa Rica, with all the information you need. We have different modes of transport, either shared or private service. With ECOTRANS private services there is no waiting time. You will receive private vehicle and VIP treatment for you and your family. Bilingual driver, 110 Volt Connector, icemaker, complementary WiFi, and air conditioning. Waiting times is minimal and we guarantee the best personalized service. To hire this service please contact our call center directly.